The Eagles approach Week 8, the midway point of the NFL season, with six wins, one loss, and a league-best five game win streak. No matter what happens in their game against the 0-7 San Francisco 49ers, they will leave the first half of the season at least tied for the best record in the NFL. How did they get here? Carson Wentz is the team in microcosm. Most had belief in the young quarterback’s ability, most thought he would be better in 2017 with a full off-season of work as the undisputed starter. Fans who pegged him as the odds-on favorite for NFL MVP this season were in the same scarcity as before. Perhaps in hindsight Wentz’ improvement is less surprising. He was already ahead of schedule once: when the 2016 season opened and he guided the Eagles to a 3-0 start just a week after Sam Bradford was traded. 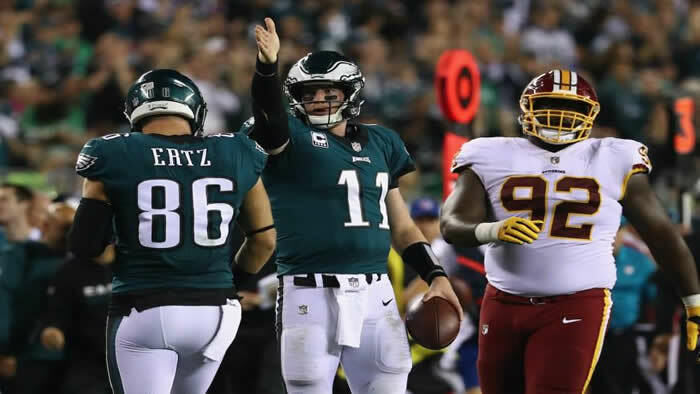 As expected from the quarterback, Wentz’ play has been the catalyst for the early victories. His ability to extend plays inside the pocket has bought time while the offensive line rotation solidified. His timing on deep balls to Torrey Smith, Nelson Agholor, and most recently Mack Hollins has turned into touchdowns. From his opening weekend touchdown throw to Agholor to his emergence from a pocket scrum Monday night, he has broadcasters and fans alike saying “Wow” at least once a week. The impact of the players the Eagles have lost is felt beyond their on-field performance and Doug Pederson admitted as much Tuesday: “Leaders on your football team, captains of your football team it can make an impact.” To the Eagles’ credit, it hasn’t yet. Halapoulivaati Vaitai has stepped in for Johnson against the Panthers and Peters Monday night and the offense has continued clicking. Patrick Robinson has performed admirably at inside corner and outside in Darby’s absence. As Pederson said, “It’s definitely the next man up. The bigger picture is we have a lot of football left. We still have a game this Sunday and the season’s not over.” That attitude and ability from the reinforcements must be maintained if the team’s success is to. Several of the injuries described above affected the special teams. Sproles was the team’s most experienced and dangerous return man. Maragos was a coverage star and captain. Sturgis coming off a season in which he set the franchise record for field goals converted. Any one of these events could have upset the Eagles hegemony in special teams excellence over the past decade, but none have. Sturgis, injured after going 3-for-3 on field goals opening weekend, was replaced by rookie Jake Elliott, who set the franchise record for longest field goal in his second game, and made his next 10 attempts before missing late Monday night. Along the way, he set the franchise record for 50-yard field goals in a season. In October. After Sproles’ season ended in the same Giants game where Elliott’s legend was born the Eagles turned to a former role player, Kenjon Barner, to fill the void. In his second game back with the Eagles Barner won NFC Special Teams Player of the Week for his performance returning punts against the Cardinals, which included a 76-yard return. In their first game without Maragos, the Eagles’ coverage unit allowed Washington to average just 18 yards per kickoff return and eight yards per punt return. After the season began with 39 pass attempts and just 20 carries by running backs in the first game the same critiques surfaced. It’s a feeling strengthened by the fact that Pederson is seen by many as an extension of Andy Reid and the former Eagles coach’s predilection for the passing game is well established. As the season has progressed nothing has been further from the truth. Perhaps it’s a function of their role preserving the lead in many games, perhaps of the fact that their bye is yet to come, but the Eagles rank second in the NFL in rushing attempts and just 14th in passes thrown. Which running back plays the lead role has changed from week-to-week, but the Eagles commitment to the running game hasn’t. Wentz’ performance on third down this season has dominated coverage, but it’s a total team effort. The Eagles lead the NFL offensively in third down conversions and conversion percentage, picking up the first over 50 percent of the time. With that ability to stay on the field and the renewed rushing attack working for them they rank second in the NFL in time of possession with the ball in their hands an average of 33 minutes and 43 seconds a game. They trail only the Panthers. The beneficiary of all that is the defense. In a far cry from the conditions they were tasked with performing in under Chip Kelly’s hurry up offenses, they’ve been on the field for the second-lowest amount of time in the NFL. It’s not all thanks to the offense’s ability to stay on the field either. The defense has excelled at getting off it. They rank third in the NFL when it comes to preventing third down conversions, allowing opponents to pick up the first just one-third of the time. They’re even better on ensuing fourth downs: despite having faced a league-high 11 attempts, they’ve allowed the first just three times.